Plantar fasciitis is that pain in the bottom of your foot usually felt around your heel. That pain is especially strong with the first few steps in the morning as you are getting out of bed and standing on your feet, or after sitting and resting for awhile. 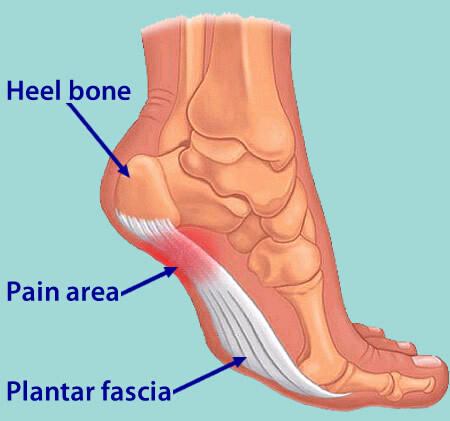 The name Plantar fasciitis comes from: "Plantar" which means something that belongs to the foot, "fascia" which is a band or ligament or a connective tissue, and "itis" which means inflammation. The band connects the heel bone to the bones of the toes. The pain is caused by injuring this tough band on the bottom of the foot. The cause of plantar fasciitis is often unclear and may be multifactorial. Because of the high incidence in runners, it is best postulated to be caused by repetitive microtrauma. Possible risk factors include obesity, occupations requiring prolonged standing and weight-bearing, and heel spurs. Other risk factors may be broadly classified as either extrinsic (training errors and equipment) or intrinsic (functional, structural, or degenerative). Training errors are among the major causes of plantar fasciitis. Athletes usually have a history of an increase in distance, intensity, or duration of activity. The addition of speed workouts, plyometrics, and hill workouts are particularly high-risk behaviors for the development of plantar fasciitis. Running indoors on poorly cushioned surfaces is also a risk factor. Appropriate equipment is important. Athletes and others who spend prolonged time on their feet should wear an appropriate shoe type for their foot type and activity. Athletic shoes rapidly lose cushioning properties. Athletes who use shoe-sole repair materials are especially at risk if they do not change shoes often. Athletes who train in lightweight and minimally cushioned shoes (instead of heavier training flats) are also at higher risk of developing plantar fasciitis.